It's ok to leave work early, take the afternoon off. It's ok to skip-out, make excuses, and get on your bike. As long as it's in the name of an obsession. Challenge yourself and Ride More by completing 10 hours over three weeks. Those who do will have a chance to be seriously rewarded by Oakley. You'll have 21 days from April 16th to May 6th to finish this task. Split it up over every day or try and tackle it in a weekend - the choice is yours. Complete this time-based challenge, and you'll earn an Oakley Ride More digital badge and a chance at winning the new Oakley cycling collection. This includes an Oakley ARO helmet, JB cycling kit and the brand new Flight Jacket eyewear. The cycling collection features the same leading designs and performance benefits that world-class cycling athletes have grown to expect from Oakley. Find out more about the collection at www.oakley.com/cycling-collection. So sign up to the challenge, join the Oakley Club, and get ready to ride more. - The ability to enter for exclusive prizes from Oakley. These include an Oakley gift card and the chance to win Oakley's new cycling collection. 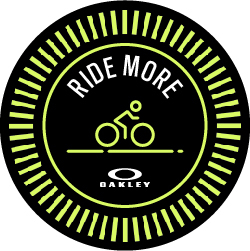 Cyclists who complete the challenge will receive an Oakley Ride More finisher's badge. One challenge finisher, chosen at random, will win the new Oakley cycling collection. This includes an Oakley ARO helmet, JB cycling kit and Flight Jacket eyewear. The content in this challenge is the sole expression of Oakley Inc.
NO PURCHASE NECESSARY TO ENTER OR WIN. A PURCHASE WILL NOT INCREASE YOUR CHANCES OF WINNING. VOID WHERE PROHIBITED. Begins 4/16/18 at 12:01AM and ends 5/6/18 at 11:59PM. Open to 18+ in all geographies. Must have Strava account to participate. A prize will be drawn using a random number selector. By signing up to the Strava challenge, you agree to receive a link to Oakley's website and MVP club and will receive our newsletter for information on news, promotions, products & offers. For more details see Oakley's Privacy Policies for Europe and The United States. Please contact Oakley for privacy policies for other regions. To learn more about how to use Strava, please visit the Strava Support Center or email support@strava.com. Please contact Oakley for all other inquiries. Prize eligibility and fulfillment is at the sole discretion of Oakley Inc.